With reference to one of the most ambitious and inspiring organizers of CESCG ever, Thomas Theussl, we can call this the year 2 a.T. (after Tom). Or should we call it year 1 a.I. (after Ivan), as yet again, CESCG organization has changed hands. Indeed, CESCG organization has reached such a level of maturity during the last few years, that it is a pleasure to see one step unfolding after the other without much ado -- just a little nudging here and there, and everything runs smoothly. It is the unabated effort put into CESCG by many people that makes sure we will have yet another very successful seminar this year! So who are the CESCG heroes that made things happen? In no particular order -- because many people were involved equally -- we would like to thank Ivan Viola, the organizer of last year's CESCG, who was always there to answer any questions; Helwig Hauser, also called the mother of the CESCG, who made many helpful suggestions. We would like to thank the organizers from Vienna, especially Andreas Traxler for his perfect work in all kinds of jobs, not least of them keeping the web page up to date, Attila Neumann for the reviewing process organization, Georg Zotti for the CD production, and Jirí Hladuvka for the proceedings production. We are very thankful to CESCG organizers from Bratislava, namely Andrej Ferko, also known as the the father of the CESCG, and Stanislav Stanek and Marek Zimanyi for the excellent on-site organization. 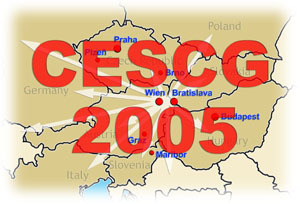 The main idea of CESCG is to bring students of computer graphics together across boundaries of universities and countries. Therefore we are proud to state that we have achieved a record number of 17 participating institutions and a very tight time schedule of 24 valuable student works and two invited talks. We are also proud that for the first time, students from ETH Zürich, Switzerland joined the seminar. We also welcome groups from Bratislava, Slovakia (UK and STU); Brno and Prague, Czech Republic; Budapest and Szeged, Hungary; Maribor, Slovenia; Bonn, Germany; Graz, Hagenberg and Vienna (TU and VRVis), Austria; Szczecin, Poland; Bristol, United Kingdom; and Sarajevo, Bosnia and Herzegovina. Invited talks this year are held by Reinhard Klein from the University of Bonn, Germany, about "Realistic Materials in Computer Graphics," and Radoslaw Mantiuk from the Technical University of Szczecin, Poland, about "Digital Photography in Realistic Computer Graphics". The seminar features an exhibition called "Large Virtual Cities". The seminar is held under the auspices of the Austrian Ambassador to Slovakia, his Excellency Martin Bolldorf, and is co-organized with the Spring Conference on Computer Graphics (SCCG), which takes place right after the seminar. Please note that the electronic version of these proceedings is also available at http://www.cg.tuwien.ac.at/studentwork/CESCG/CESCG-2005/.